Every year, my dear friend Melissa comes to visit me on the way to her family's beach trip. Most years I have made presents for her three beautiful boys, like these jammies or these hats. This year I knew I had to give her something special. This has been a rough year for her. After a long battle with complications from rheumatoid arthritis, we lost her mom (my godmother). She is one of the most inspiring people I have ever known. Aside from being the most wonderful godmother, mother, grandmother, wife and friend, she was also a tutor for children with special needs. A former student gave a eulogy that summed up what a difference she had made in so many people's lives. He struggled with dyslexia and credited the patience of Linda for teaching him how to cope with this handicap and eventually to thrive in school; to go on to earn his graduate degree. He stated that he never felt safer than when he sat at her kitchen table for tutoring sessions. This quilt is to celebrate an amazing life, an amazing woman. Our mothers were roommates and sorority sisters together in the early 70's at Penn State University. This Dream On fabric line from Urban Chicks looks like it could have been the bedding in their dorm room. Or swatches from their pretty party dresses. Bright and sunny and flowery and upbeat, just like Linda. 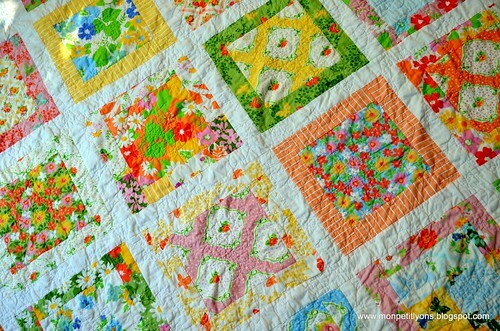 We quilters know that to give someone a quilt is to give someone comfort and love. We hope that by wrapping themselves up in the quilt they can feel us hugging them from far away. A gift that says I am here, I care, I love you. Of course I had to add a label. I used stamps and fabric ink. Forever Friends. We always have been, and always will. 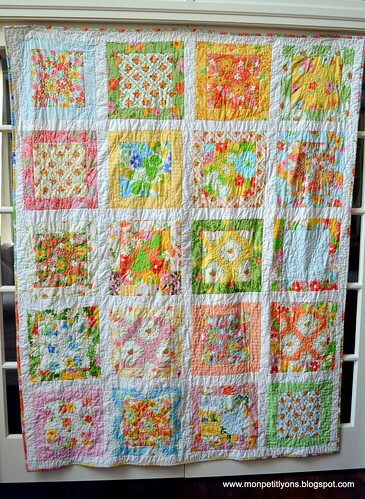 Courtney this is such a beautiful quilt and an amazingly thoughtful and sweet gift...something to be treasured for sure! 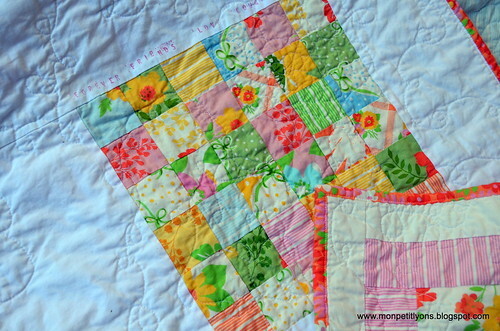 a very pretty quilt. I love the soft colors. 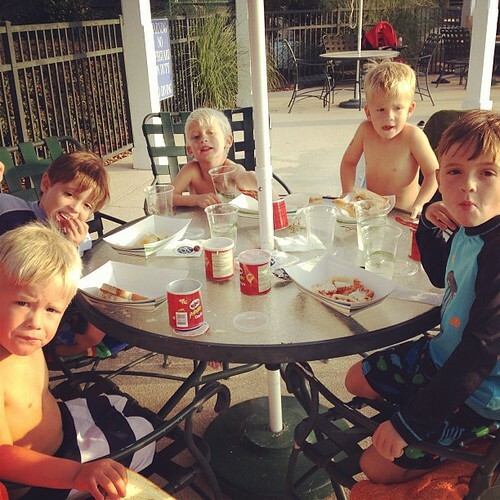 these boys are adorable. I agree - a beautiful quilt to go with a beautiful story! 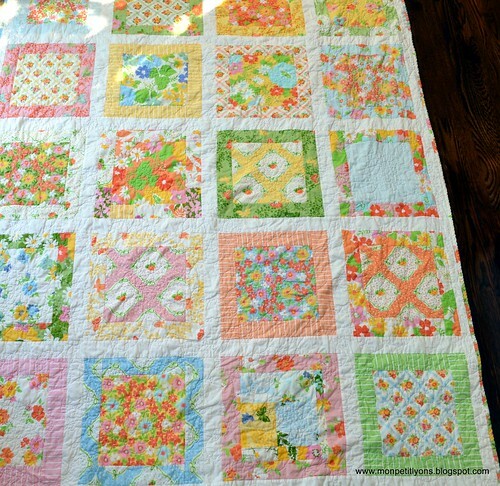 Beautiful quilt Courtney and a lovely story to go with it. 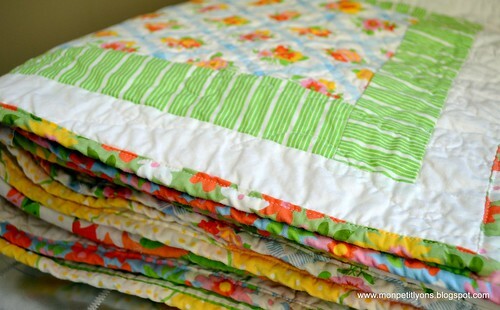 The fabrics do look like vintage sheets and curtains. Are Melissa's boys twins or triplets? They all look very similar. My kids would be the blondies in the photo too!